A recent study by urban forestry guru David Nowak and other researchers at U.S. Forest Service and The Davey Institute found that urban trees save at least one life per year in most cities and up to 8 people per year in large metropolises like New York City. “Trees growing in cities help clean the air of fine particulate air pollution — soot, smoke, dust, dirt — that can lodge in human lungs and cause health problems,” Grist explains. As an example, “trees clear 71 tons” of air particulate matter 2.5 micrometers in diameter (PM2.5) from Atlanta’s air each year. As explained in a recent post on outdoor air pollution, urban particulate air pollution kills as many as 2.5 million people each year. PM 2.5 has a drastic effect on human health, including premature mortality. Researchers noted that larger particles between particulates 2.5 to 10 micrometers in diameter—also called coarse dust particles or PM10—are removed by trees at a substantially higher rate. However, the health benefits of PM2.5 removal is 30 to 350 times more valuable. What happens to our health when those trees die from natural causes en masse? Apparently, as another recent study claims, people die, too. This study study showed that the “loss of trees to the emerald ash borer increased mortality related to cardiovascular and lower-respiratory-tract illness. This finding adds to the growing evidence that the natural environment provides major public health benefits.” Untrammeled development would then also have the same negative health impacts at the ash borer. Of course, the health benefits are not restricted to our lungs and heart, but also our minds. As can be seen in a new UK-wide study, parks, gardens, and even street trees in urban areas improve the mood and mental well-being of the surrounding residents. The study concludes that “trees can produce substantial health improvements and values in cities.” Although more research is needed to improve these estimates, this study also leaves room for new research that explores the local effects of tree-filled landscapes in cities. 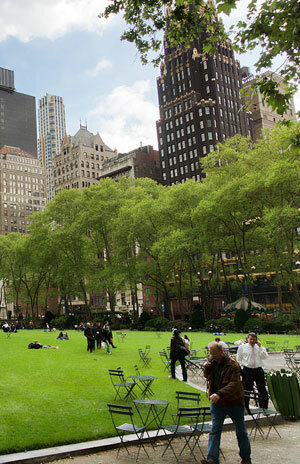 Read the study and check out a recent animation from ASLA: Urban Forests = Cleaner, Cooler Air. To whom it may concern: It is always of interest to read your articles or quotations. These figures given, are they all the same for all trees or does a foliage type react differently from a conifer or an evergreen tree? For example compare an Acer palmatum to a Magnolia grandiflora for foliage. How detailed are these studies? We are now planting more vertical trees, because our streets cannot accommodate the large Elm tree type tree and we do not have enough space for the root system. How does this change effect the studies? Too may landscape architects over plant and in regard to trees do not think of 30, 40, or 50 years ahead. I live in Parkmerced in San Francisco. This was designed by Thomas Church in 1942. I drive past some Pinus radiata that have a spread of more than 60′ per tree. What a site to see.